I saw three of the four CT Librarians last night at the CLC Annual Meeting, and hope to see them next in New Orleans! Haven't posted in a bit since Blogger seemed to have trouble whenever I was available. Stay tuned. Today I found a couple more friends who have posted on the Connecticut Four. ALA President-Elect Leslie Burger was at the press conference in New York. Past CLA President Chris Bradley wrote about our friends. Better yet, on TV, the lead story at 6 pm on New Haven's Channel 8 featured the lead plantiff and other librarians. [The openning is in front of the Cheshire Public Library, but the interior shots all seem to be of the Cora J. Belden Library in Rocky Hill....whose director Betsy Bray is included in the story.] This is the longer version from the 6 pm news, I saw the shortened version at 11 pm. The post below appeared on Conntech (the Connecticut state-wide list). I have posted it with Peter's permission. I have always respected Peter, and the letter below solidifies that respect. I want to thank all of you for your courage and discretion in my recent difficulties with the FBI. As you all know by now, I was one of the "John Does" in court papers in the John Doe (Connecticut) vs. Gonalez case. It was an anxious and difficult time for all the members of John Doe, George Christian, who actually stood up to the FBI face to face, Barbara Bailey and Jan Nocek, the other members of the Library Connection Executive Committee, who had to make far reaching decisions under threat. We were called on to risk a lot and did not back down. The National Security Letter served on Library Connection required no judicial oversight. The FBI did not have to show anyone that the private information they demanded was for a legitimate investigation. NSL allow them to get any data whether it concerned criminal or terrorist activity or not. When we received ours, NSLs had already been declared unconstitutional by a district court in New York. 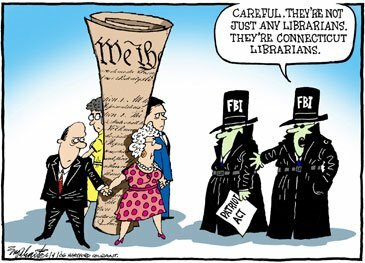 The government was telling Congress that they didn't use the Patriot Act against libraries and that no one's rights had been violated. I felt that I just could not participate in the fraud being foisted on our nation. We were supposed to protect our reader's intellectual freedom and the members of Library Connection. We had to defend ourselves and so, represented by the ACLU, filed suit against the government. I saw some of you first through a one way video connection that terminated in the Hartford Federal Courthouse. We were not allowed into the Bridgeport Courthouse that day to hear our own case, but were able to watch from a locked room in the Hartford Courthouse. We past through two sets of security screening before we were escorted to our locked room and heard our 'minder' tell us on three separate times that we could see and hear the proceeding in Bridgeport via the television monitor but that no one could see us. The television picture was fuzzy. The camera was pointed out to show the lawyers and the spectators beyond, but not the judge who must have been sitting behind it. I had told no one why I was going to Hartford that day and assumed that our hearing was known only to our lawyers from the ACLU and ourselves. And then, through the fuzzy TV monitor, I saw some friends. Spectators were filling up all the available seats in the court room and several looked to be old friends from CLA. They didn't know who John Doe was but attended to show support. That was the first time that I realized that it wasn't just the four of us against the entire U.S. Justice Dept. It was important to me. Keeping our involvement secret became increasingly difficult as time went on. My name was not redacted from the initial court filings made public by the government. After that issue was fixed, it was discovered that "Library Connection Inc." had also been left in the papers. The press discovered the errors quickly and printed their speculations about George Christian and me. We could not do or say anything that would indicate our involvement in the case. I refused all invitations to speak about the case or even the Patriot Act for fear I would reveal something that only John Doe could have known. By mutual agreement between the government and the ACLU, we were allowed to attend the hearings at the Second Circuit Appeals Court in November, but could not enter the courthouse at the same time, talk to each other, sit next to each other or make eye contact with our attorneys. We were aware that we could be charged with obstruction of justice if we slipped up. While we were gagged, Congress reauthorized the Patriot Act. The government assured Congress that no one's right to free speech had ever been violated by the law. We received many calls from the press at work and home. My staff never once asked me what was going on or why they were holding all my calls from national reporters. During the entire period, no librarian in Connecticut ever asked me if I was John Doe. They showed enormous discretion. Not one of the over 1,000 librarians in Connecticut ever pointed out George or I to the press as the most likely candidates to be John Doe. While many articles about the case were posted on Connecticut library listservs, none were ever posted that mentioned George or me by name. If a thousand Connecticut librarians could keep the secret, why couldn't the Justice Dept.? While John Doe won the right to identify himself, the question of the NSL for private library information has not been settled. I want to thank everyone for their support in this difficult matter and, as much as I am allowed, will keep you informed on case.